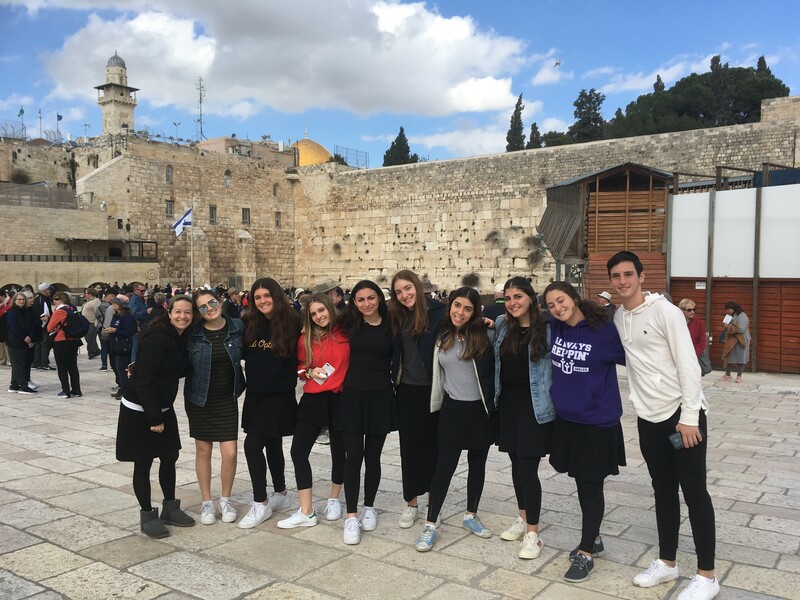 Ramaz Team Shalva runners spent a whirlwind weekend in Israel. Upon arrival we toured the Shalva Center and danced with the Shalva kids. The Center is truly impressive; the largest structure of it's kind for disabled kids, super beautiful in design, very clean, and full of the latest technology. At night, there was a concert from the famous Shalva band and a big pasta carb-loading party before participating in Friday's Jerusalem Marathon and races. Jake and Oliver got up at the crack of dawn to run the half-marathon and the rest of the Ramaz 10K runners first did the Shalva community run (800m) and then went for the 6.4 miles! We all had a great time and met back at hotel for lunch, and then quick trip to kotel in the afternoon. Shabbat was really beautiful. It was fun spending it with 500 other teenagers. We heard from Esther Wachsman, who, even though I've heard her speak a number of times, is like you're hearing her for the first time all over again. Nachson z'l was her third son, but I did not know that she has 7 sons, the 7th of which has Downs Syndrome, and has been very involved with Shalva over the years. But now to Sunday. Everything until Sunday was amazing, and beautiful, and made us realize how lucky we are and how much we have to give, but Sunday was different. Sunday was quintessential Ramaz at its best. On Sunday morning, we set out on a Ms. Benel/Ramaz Chessed Special. Our morning started bright and early with a visit to "Save a Child's Heart" in Holon. We all agreed it was one of the most amazing hours of our lives. The home is full of children who are flown into Israel for open heart surgery needed for congenital heart defects. The surgeries are performed voluntarily by Israeli cardiac surgeons. Many of the children are not remotely Jewish or connected to Israel; they are simply there because their own countries cannot provide the medical care that they need. The center also has internship programs where they train doctors from those countries to do these surgeries. The kids stay, some with a parent, some without, in the home while they recover from surgery before they go back to their country. Our students begged me not to leave - they wanted to stay all day. Next we had a quick 20 minute bus ride to the Reut Rehabilitation Center, a renowned center in which victims of terrorist attacks, car accidents, bike accidents etc, live for months while receiving intensive therapy so that they can hopefully walk and live again. We participated in art and gardening therapy with them, heard from the Director of the Center and chatted with a bunch of Israel teens who volunteer at the Center. We heard the stories of many of the wheelchair-bound patients, their hopes and dreams to be able to walk again one day, and their love and appreciation for the many amazing and patient therapists and psychiatrists who help them through every day and their post-traumatic stress. Again, it was impressed upon us that many of the patients in the hospital are Arabs, or not remotely Jewish. The center serves anyone who needs its services. As the director said, "It isn't about a Jewish identity, it's about a human identity." But it was certainly a proud Jewish identity that we felt that our country, our people, were the ones opening its doors, its finances, and its skills. We had super brief (30 minutes!) for ice cream on the Tel Aviv Banana Beach and then moved on to our last stop of the day - Achuzat Sarah, a home for about 100 students who Family Services has deemed not safe to live with their families. We spent 4 hours there - helped run a Purim carnival, played soccer with the kids, got a tour of the place, and learned a lot about the super special kids and staff. By the time we left for the airport at 8:00 PM, we were exhausted, but felt like we had had the day of a lifetime. Hakarat Hatov to Ms. Benel for helping plan this overwhelmingly special day; the students will never forget each moment. Everyone should be really really proud of our students. It was a long, full and exhausting day and every one of them was energized, smiling, chatting, and giving of themselves every minute of it. We did a "summary session" on the bus to the airport and every single one of them came away moved, touched and wanting to find ways to bring these moments of giving into their everyday lives. And, we are all so grateful for the blessed lives we have. So proud of them!